Primrose Baker was watching the maids of Madeline’s Academy set up a room. The dormitories in Madeline’s were co-ed. With only 100 students total in the Academy, there was about 20 kids on each floor, two kids per room, making the building 5 stories tall. It was the largest building in the Academy. Prim stood outside her own dorm room, watching the two human women come in and out with fresh sheets, new toiletries, and multiple bags of new uniforms. The newcomer would be set up in a room alone, located three doors down from Prim. She didn’t know anything about a new student, and it was incredibly surprising to suddenly see the maids cleaning up and getting things ready. By the looks of it, other students had no idea either, as they all passed by and openly stared, whispering to each other about the possibility of a new student. “Why are you just watching them?” A male voice, pulling Prim out of her thoughts as she turned to greet her friend. Damon Anderson had taken off the thick sweater vest the school forced them to wear. The tie around his neck was also loosely tied, and his sleeves were pushed up to his elbows. Prim was located on the 5th floor, and Damon’s dorm room was located on the floor beneath hers, but that didn’t stop the boy from making frequent visits. Prim smiled at him before turning her attention back to the maids. “It’s just surprising, is all. I haven’t heard anything about a new kid. And it looks like no one else has either.” Prim said quietly, her eyes following two girls who stared at the maids as they passed. “Sounds like jealousy,” Damon mocked, his face spreading into a wide smile. “Yeah whatever,” Prim laughed, heading back into her dorm, Damon following inside and closing the door behind them. And although both friends sat around her television and discussed school, drama, and teachers, Primrose couldn’t shake off the feeling that something was off. She hoped it was just the fact that there would be a new person living in the same floor as her, and that everything would be okay. Little did she know that in three weeks her life and the world would begin to change forever. The new student arrived in a large, black SUV. The kind that you’d assume the president or someone important would drive around in. He was allowed three bags in total, and as the car came to a stop at the curb in front of the front office of the school, out came a blonde girl in her teens holding a clipboard. She too was wearing the uniform that all Madeline’s students were required to wear. Kate had no idea what kind of ability Oscar possessed, but whatever it was she was sure it’d fit right into Madeline’s. Her eyes raked over the boy, and her smile only widened. One of perks of being Gifted was that everyone was freaking hot and this kid was no different. As she greeted the newcomer, two bulky men dressed in black had also exited the office, retrieving the boy’s bags and carrying them inside. “I’ll be showing you around. Think of it as a really cool tour. It won’t take that long as we’ll go over the absolute basics; office, dining hall, training arena, classrooms, dormitories. If you want a more detailed tour I would happily oblige. We could schedule one tomorrow. I’m like the ears and eyes of this school. I know the history and basically everything about Madeline’s,” Kate continued on, glancing at her clipboard before checking something off. “Your bags will be in your dorm. You’re in dorm 11F. It’d be the last door on the fifth floor, and before I forget here is your key card and student ID. Don’t lose it! If anyone else gets their hands on it they can get into your dorm room and steal your lunch, as key cards have to be scanned before receiving meals. If it is lost at any point during your stay please let us know immediately so we can block this card and issue you a new one.” Kate talked fast, unreasonably fast. She handed Oscar a maroon colored card, the exact shape and size of a credit card or Visa card. It had Oscar’s full name on it, as well as his student ID. “Any questions, comments, concerns?” Kate finally looked up at Oscar, her pen poised over the clipboard to take down any notes if need be. The day was quite sunny compaired to the normal glommy days of UK. The van blocked out the harsh light which he enjoyed. He feared his future at this school, knowing he would be the one people would talk about. But he was not strongly certain of his powers. He was still tinkering around. He was reluctant to get out of the van but he did and Kate was right there and just spilling words out that mostly he didnt hear. But he managed to shake her hands and nod at the comformation of his name. This was a giant relam of a school. He shoved his hands in the pocket of his nicely fit jeans. He heard her ask if there was anything else and he couldnt help but manage his first words of the day to her “No, please continue” his accently clearly making its way through his teeth. He held his tounge for this place definetly had more in store for him. He was going to take the ladies offer on the tour tomorrow but he didnt need the past, he needed the present. This was to behis living place for a long time, he had better start settling in on his own. The two males that came to get his bags were welcomed to take them. Oscar didnt have anything to hide but the school might never have a style quite like his. Soon enough they would know. Kate nodded, jotting something down before waving for Oscar to follow her. “So where are you from?” She asked as they walked into the office. The elderly secretary at the front desk smiled at both students, and Kate waved at the woman as she led the boy through a door off to the side and down a long hallway. It stretch several feet, giving the feel of a hospital. The walls were dotted with photographs of students, all smiling and in the same maroon uniform. They began as black and white photographs — from the 1960’s — and slowly turned into color. They had dates at the bottom, and the very most recent one was of a curly haired girl. “This is the “Hall of Fame”,” Kate explained, not looking up as she studied her clipboard. “All the very best students make it up on here. Our headmaster is on here as well, actually. Right there.” She pointed to a black and white photograph, of a boy in his teens wearing wirerimmed glasses. “The most reason one is of a student who still goes here. Primrose Baker.” Kate said, slightly rolling her eyes. It was clear the blonde didn’t like the other girl, but quickly covered it up by continuing on. “Your accent is British right? We don’t get many brits. We honestly don’t get many students at all. I was really surprised when they told me about this orientation. Madeline’s is super strict about letting new people in.” Kate eyed Oscar, curious about what his ability was. About why he was here. She knew nothing about him, as she was merely a student herself and that was considered private information. As she waited for a response, she opened the door at the end of the hallway and held it open for the boy. It led into another hallway, busy with activity. Students were milling about, standing at the maroon colored lockers that were mounted on the walls. Several students noticed Oscar and quickly began whispering amongst themselves. It was a small school, everyone knew everyone and his face stood out immediately. Oscar just kept to himself walking through the hall. He gave a small wave to the wonderful elder lady who waved. He was really close to older people as they seemed to better understand his maturity it seemed like. But he continued on ward with Kate anyhow. When asked about his hometown he nodded in a response “Ah yes, London is my home. Born and raised, it was swell and all but got myself into a bit of trouble and here I am.” He stated. As he walked she continued to add the lack of foregin students let alone those that are British. He chuckled charming at Kate “Yeah well it’s nice to be here” he keeping his hands lodged in his pockets. She opened the door delicately for him to which he continued to walk through. Looking around and taking in the scene. This school was a lot bigger than expected. “Your locker should be... here,” She said, walking down the hall approximately three or four feet before stopping at locker 101. It was a long maroon door, instead of the usual long door cut in half to make two lockers which were normally seen in public schools. Madeline’s was a private school, with not many students. The school was well funded, and everything about the buildings screamed that. It was all clean, and well kept. “We don’t have locker combinations,” She said, gesturing to the small panel where a lock would normally be. Flipping the little piece of plastic up that covered the panel, a small square sat underneath, lighting up in green. “It’s all fingerprints. That way it’s harder for other kids to break into them. It still happens — but rarely. Go ahead and put your thumb so it can read it. Most of your school books are already in there. I’ll give you your schedule once we’re done with the tour and all that. We don’t have many ‘normal’ classes. We’re all group together by age, mostly. Unless you score significantly below your age group.” Kate waited patiently to the side for Oscar to put his thumb print, she glanced around, looking for no one in particular. As Oscar was looked at from the students around the hall he couldnt help but admire the people around him. He listened carefully to the instructions. He glanced at Kate with a gentle smile and placed his thumb on the high tech that was Madeline. He was proud to be a memeber of the school. The locker ticked and the gears grinded and it snapped open to show he was accepted. He looked at her and nodded “locker 101. Got it” he replied and took a step back to make sure he wasnt standing too close for Kates comfort. He looked at her with a narrow eye “Are classes based off of abilities here?” He wondered curiously. He would have hoped to see Primrose Baker around somewhere in order to introduce her competition. He believed that the Hall of Fame was not yet prepared for Oscar North. Still no one knew how much power he had. As Kate talked, she continued down the hall. There were several doors between the lockers, leading into classrooms. The school was large, but most of the classrooms were small considering that there was at most 15 students in each. The classrooms were connected to the office building for easy access in case of emergencies. Coming to the exit, she pushed open the door and stepped outside in a large octagon shaped courtyard. Several picnic tables sat around, with students sitting at them. The sun was shining brightly on the courtyard, and Kate used her hand as a shield as she debated where else to go. 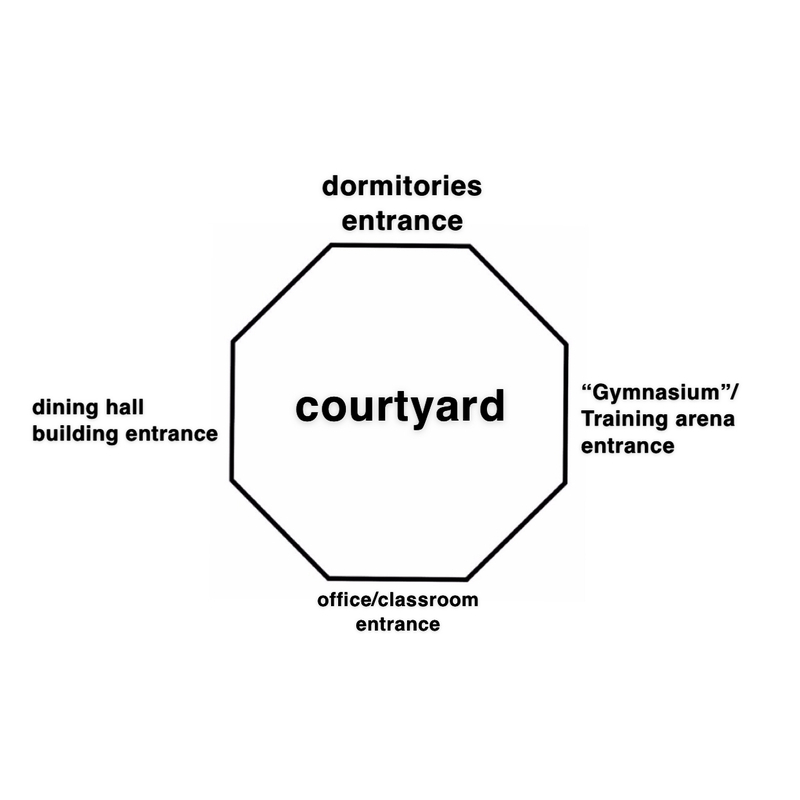 Surrounding the octagon shaped clearing were multiple buildings that lead to the dormitories, the dining hall, the gymnasium, or back into the office bundling. The school was designed to essentially wrap around the large courtyard. After some thinking, she decided to lead him toward the dining hall. Oscar admired the organization of the Madeline school. This made him want to know more about its inner workings. Like for instance how one gets from the bottom to the top the fastest or who for instance would he need to compete against to get on the Hall of Fame? So many questions surged through his mind all at once that soon he was overwelmed he stopped just before entering the next room which was the dining area he stood silent then looked up with a smile “Let’s continue” he ignored like what just happened never even occured. He was feeling ultimate anxiety, which was normal when his mind rushed and he thought too much. Not always was a it a situation to throw him over. Madeline was not what he ever expected, there was a lot more to know, a lot stricter roles, and yes maybe something very usual lying underneath all these classes. These people who stared at him now might be facing him off before they knew it. Oscar was strong and not going to let his disorders and flaws overrule him. He snapped out and entered the dinning hall, multiple tables alined the room scattred around. A pretty basic eating corridor but still amazingly shocking how many students were present. Oscar then couldnt help but wonder if he would sit with someone, a group, or alone. Kate was quickly becoming weirded out. Sure he was hot, but the kid was clearly very strange. Once he had peeked inside the dining hall, the girl continued toward the dormitories. The large building was five stories high. It towered over the rest of the buildings at the school. She entered into the common room of the building. Black leather couches and La-Z-boy chairs littered the large area. There was multiple flat screens mounted on some of the walls, with gaming systems plugged in. Off to one corner of the room were multiple desktop computers. “This is the common room,”She said, glancing around. It was empty for he most part, except for one girl sitting at one of the computers. “Most of the students here have their own laptops. But in case it breaks or something you can use these. Your ID number should let you log in.” After allowing Oscar to view the room for a few seconds, she headed toward the three elevators and pressed the arrow signaling up on the middle one. Oscar took it all in staying quiet as she explained the in’s and outs of the rooms. He wanted to fit in but at the same time he was happy to have his own little place to chill out by himself. Considering he was a pretty lonely kid. He shook his head when she had asked if there was anything to add. He continued by walking into the elavator. He hadnt ridden one in a long time, but luckily he could handle them enough not to freak out completely by them. He leaned against the wall inside the elevator and then at Kate “Where might I find Primrose Baker?” His accent rolling off at her name. It was...bizarre but yet so, power? He didnt know how to explain it. It was one name that struck his mind when he thinks of Madeline now. But strangely some part of him believed that Kate should be afraid of him. He wanted to see her, but yet keep his distance. She probably had no idea of his exsistance. But maybe soon enough. Oscar was never really into the romance category. He always found himself in the lame wannabe isle. He was always looked at but never didnt someone take the time to know and understand him. He knew Kate was uncomfortable by the way her stances became and the way she spoke was more...rushed. He didnt mind though because this tour was long. But at the same time it felt nice to walk around with someone else than try and guess where to go all day. He then wondered if Primrose Baker would be asshamed to walk with him.